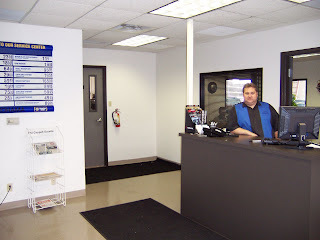 Last year a few of our loyal customers started hinting that our service was slowing down, especially for the quick preventive maintenance, like an oil change or tire rotation. We figured a lot more of you felt the same way, but were just too nice to tell us. So, we decided to fix the problem by adding some more space...a lot of space. And brand new, sparkling clean bathrooms! The office moved, but we're still next door to Coppell Middle School West, just one door down from our old entrance. Feel free to park in the main lot off of Crestside Drive or along the west side accessible from Wrangler Drive. We hope you like it. And if you have any other ideas or concerns, keep them coming. Thanks for your business!